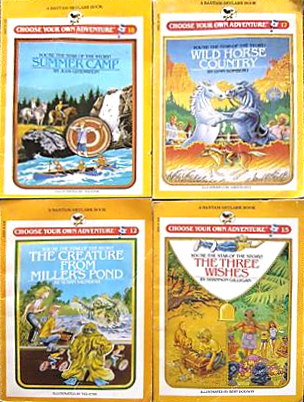 Over nineteen years from 1979, 184 Choose Your Own Adventure titles were published. Their unique selling point lay in allowing you – the reader – to make crucial plot decisions in the story by directing you to a particular page in the book dependent upon what choice you made – like whether you opted to ‘walk toward the Indians and return the peace sign’ (surely the right answer) or ‘prepare to shoot it out’. Indeed, one of the by-products of the series was an unwanted lesson in morality that taught us that to do the thing you think will be most exciting and violent will invariably result in your own abrupt death. 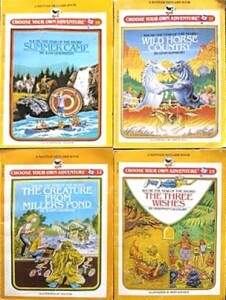 Whilst perhaps the most ubiquitous, Choose Your Own Adventure was far from the only purveyor of such fare. TSR Hobbies (makers of DUNGEONS & DRAGONS) knocked out a few under the banner of an Endless Quest and Puffin produced what seemed like hundreds of Fighting Fantasy titles most of which were written by Ian Livingstone, Steve Jackson – or both. The big downfall with these books was that they relied on the reader rolling dice to determine whether or not they were successful in combat, and given that we couldn’t be trusted to play a single adventure from beginning to end without cheating, the belief that we might actually abide by what a die said seems laughably naïve. I’ve still got a couple of the Interplanetry Spy books also published by Bantam. Pages labelled “The End” figure highly in them. Edward Packard has a posse.